So earlier this week I went up to London to help my beautiful cousin (Jane) move into her new flat. Jane and I decided on The Northbank Restaurant which looks out onto the Thames and is tucked underneath the Millennium Bridge. She explained that it’s unknown to tourists and I was sold. Excellent modern décor with a view of the river from the floor length windows that surround the restaurant. On arrival the waiter, Angelo, picked out some gorgeous reds for us. We started on an Italian Chianti, then moved to a Chateau Cabezac. I started my dinner with the Spiced Cornish Wood Pigeon with celeriac and red wine, it was beautiful. The pigeon was tender and perfectly cooked, just a little pink in the middle which is how I like it! The celeriac and red wine complemented the meat well. 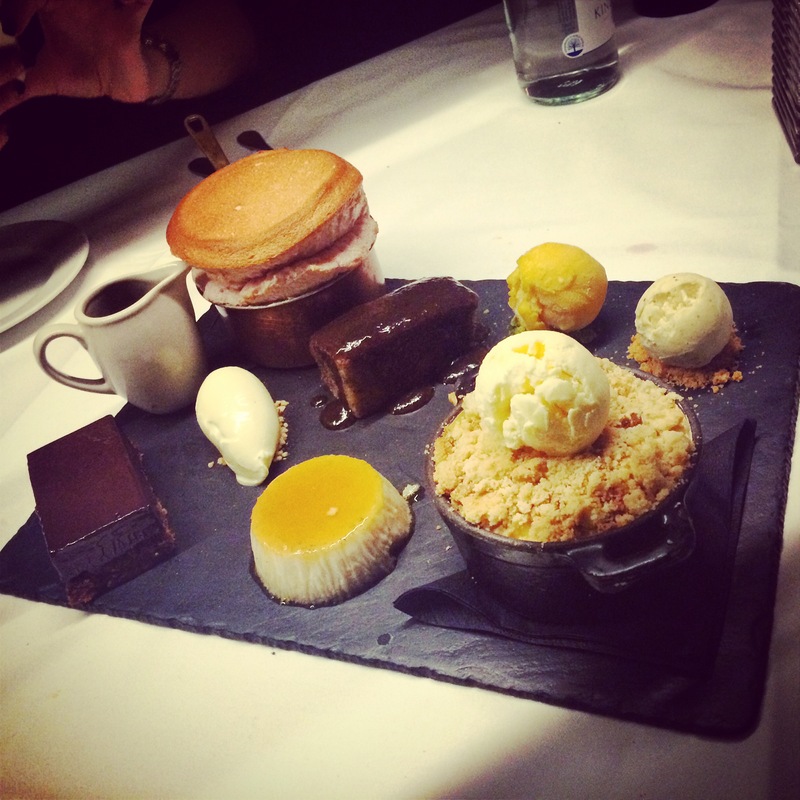 The presentation was also lovely – who doesn’t love a slate plate!? Now the main course. STEAK. We were all sat there drinking red wine and couldn’t resist. Rib-eyes all round please! Mine was cooked rare and I chose the truffle oil for my sauce. The steak was tender and cooked to perfection. We went for sides in the centre of the table that consisted of crispy kale, roasted parsnips, spiced broccoli, chunky chips and finally cauliflower and bone marrow gratin. It was a real experience, high standard of ingredients and just all round yummmmy. Comfort food made exciting with the chef’s use of seasoning and the fusions of flavours. Dessert; the three of us had everything on the menu on a taster board. My god was it worth it! Everything just made you ‘mmmmm’ whilst you ate. I don’t feel I need to explain much about these desserts, the picture says it all. They honestly tasted as good as they looked.